← Sunday, September 7, 2014: Will it be Armageddon Day? There is a lot to like in this next story. Life may exist on an ice-world that glows red in the light of Jupiter’s torch. This is an interesting idea derived from NASA data that had been sitting on a shelf for ten years. It just took hard work and keen minds to connect some dots, but the idea that Jupiter’s satellite Europa has tectonics transforming its ice-clad surface is important. Europa has been getting some attention as a potential lively spot in the solar system. Lively in the sense that the remote moon may harbor life. Microbes, not Spocks – but life, nevertheless. Europa has an oxygen-rich atmosphere and a smooth, shiny surface that seems to be ice. 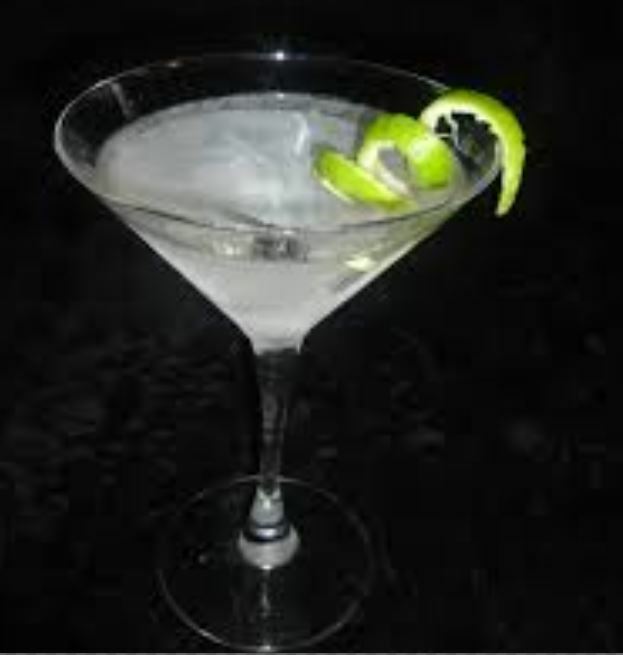 Not methane ice or frozen nitrogen, but good, old-fashioned martini-cooling ice. Last December, scientists observed a huge geyser that was spraying water far into the atmosphere. 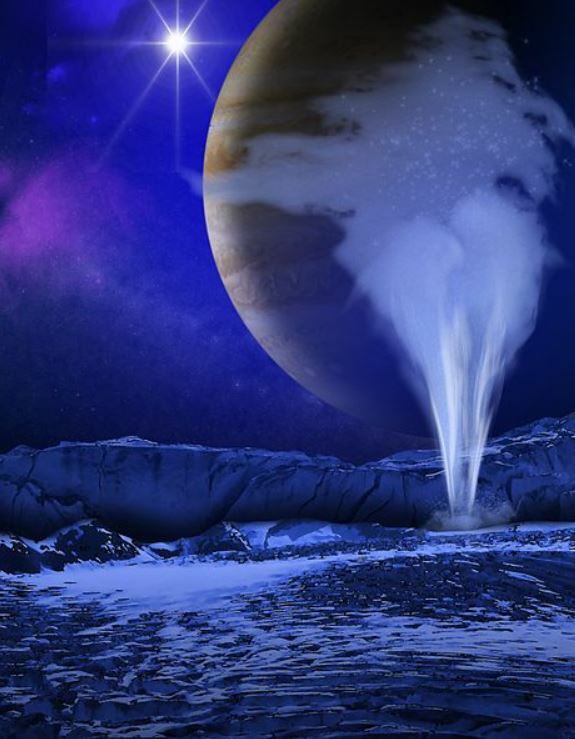 Europa has ice covering seas of water. And the water can be geysered right through the ice. How cool is that? Scientists have puzzled over Europa’s smoothness. Europa is thought to have the least interesting surface of any (observed) orb in the solar system. It is interesting because it is so uninteresting. Having the smoothest surface means a lack of volcanoes and mountains – if any exist, they are below the ice sheets. But researchers also think that the lack of really old craters from meteor bombardment is also strange. The oldest are perhaps 60 million years in age. What happened to the craters from meteors that hit Europa in the days before Earth’s dinosaurs? Subducted, say geologist Simon Kattenhorn and planetary scientist Louise Prockter. They reported this in Nature Geoscience yesterday. The two scientists pored through pictures from NASA’s Galileo spacecraft, which orbited Jupiter from 1995 to 2003. Not all of the old photos were sharp, so they concentrated their efforts on an area where some high-resolution imagery existed. Then, in the fashion of earthly tectonics advocates of the 1960s, they slid around jigsaw-puzzle pieces of what they saw. From that, the scientists reconstructed ice sheet movement, mimicking plate tectonics. “We looked at an area about the size of Louisiana,” says Kattenhorn, “and there was a missing piece the size of Massachusetts.” That missing piece is assumed sub- merged under the global ice, taking old meteor craters with it. This would only work if the underlying material – just below the ice – was warm liquid water. There is some evidence of cryolava (partially melted, slushy ice that flows like hot-0-lava) on one side of inferred subduction zones, but not on the other. We see something like this on Earth, where volcanoes appear on one side of a subduction boundary (such as along an island-arc) but not on the other. Other scientists have noted that Europa has signs of extension with surface patches that seem to widen with time. If the surface is widening, then distal areas must be piling up the excess that is moving away from the spreading center. But, Europa lacks mountains of ice. So, there has been a long standing hunch (since at least way back in 2006) that subduction is taking place on Europa. Kattenhorn and Prockter have possibly identified the visual evidence. Earth has smooth ocean crust without truly ancient fossils. Earth has trenches with island arc subduction zones with hot lava on the island side. 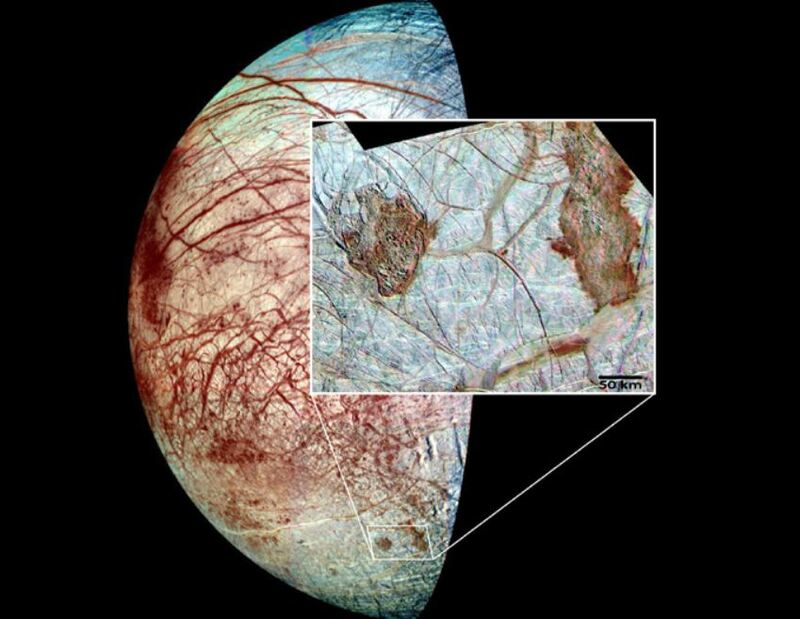 Europa has a crusty ice surface that appears to change with time. Does Europa have ice tectonics? Probably. Most geo-biologists point out that plate tectonics played a big role in the evolution of life on Earth. Astro-biologists are suggesting that subduction and accompanying implied convecting warm water may have created a microbe-friendly environment in the seas of Europa by distributing salts and minerals to hungry little organisms. By the way, you may have been wondering how Europa could have liquid water when it is so far from the sun. Shouldn’t the satellite be an icicle from surface to sea floor? The little world’s heat source seems to be gravitational pressure – tidal forces – caused by Jupiter. The massive planet exerts enormous mechanical energy on Europa. That energy is translated into heat, keeping the water melted. “We propose that Europa’s ice shell has a brittle, mobile, plate-like system above convecting warmer ice. Hence, Europa may be the only Solar System body other than Earth to exhibit a system of plate tectonics,” Kattenhorn and Prockter wrote in Nature. Now, that’s exciting! This entry was posted in Plate Tectonics, Space and tagged convection, Europa, subduction. Bookmark the permalink.